This week starts the Fall 2017 edition of the Bloggers Quilt Festival, and I have decided to participate too and share one of my most recent, most favourite finishes and one a few of you will have seen here before, my "Queen of the May" quilt. On my last trip to Melbourne I visited Somerset Patchwork and fell in love with Karen's quilt 'Circle of Sisters' that was on display in the shop. It was such a bright recreation of a vintage quilt. The blocks were on a wonderful yellow cheddar background, the whole quilt simply glowed, and I've always loved the idea of making a quilt one day on something so bright too. And so back in January this year I jumped right in! Inspired by Kathy from materialobsession and her use of contemporary fabrics with traditional designs, I've been experimenting more lately, mixing and matching bright fabrics from my scrap basket. I used a template set "queen of the May" from way back, it was my favourite block from an earlier Material Obsession BOM quilt that I made. The 'printonprints' effect is quite wild and colourful, and a fun way to go! It's such a very different direction from where I would usually go, and the hardest thing was not to make them all too nicely co-ordinated. Choosing my background fabric also proved tricky. After quite a few days of experimenting with different borders, different sashings and different settings, I ended up using the lovely Victoria Findlay Wolfe yellow floral, Elise Mostly Manor. Such a riot of busy happy colour! As I made up the blocks and trialled them on the yellow background they seemed to get a bit lost on it. So what to do? Then I had a light bulb moment ... ric rac. I really enjoyed making this quilt, from making all the wild fabric choices right through to the traditional construction. You can read lots more about my inspiration details and decision dilemmas from an earlier post here - it is my most popular post so far. it's a great way to discover and follow new quilting blogs too. That is a magic quilt. I love all the fabrics as well as the glorious background. The ricrac is genius. 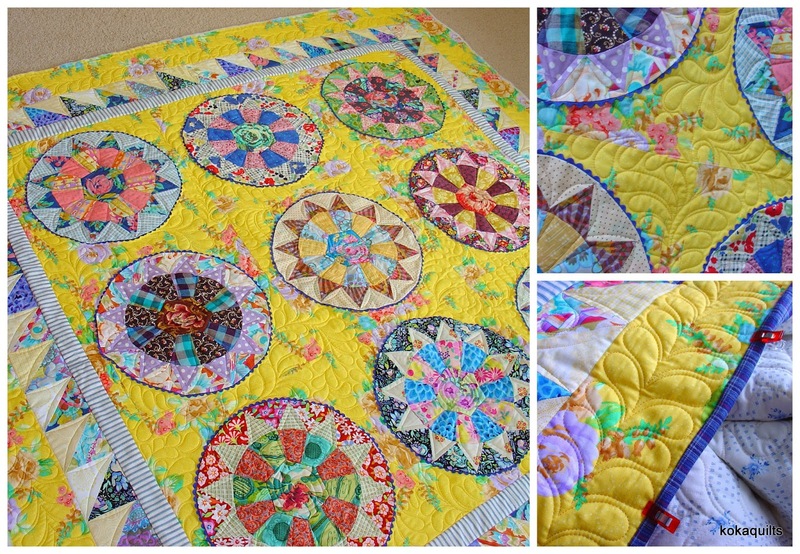 I am a HUGE fan of this quilt! This is such a happy quilt!! The yellow Victoria fabric is a perfect background and the choice of adding ric rac brilliant! Thanks for sharing! Linda - I love your quilt! Yellow is one of my favourite colours to use as it is so happy. I really enjoyed reading your post. Yellow makes such a happy color. Great background. Love the circles and fabric choices. You and Audrey have convinced me to link up with the festival. It's fun to see our quilts together. Thanks. If there were voting this year, I'm certain I would vote for this quilt, Linda. Yellow is one of my least favorite colors but in this quilt it's wonderful. I love the print on print look. You have a real knack for combining fabrics! I know I said how much I loved this quilt on your earlier posts but I'm saying it again....... simply gorgeous! Spectacular! Beautiful! Gorgeous! Wonderful! Can you tell I love everything about it? I've been crazy about this gorgeous quilt since you posted the first block! Ahhh... I so love this quilt. It has such an excellent vibe going on, all the lovely florals and crisp yellow bite! Wonderful work! 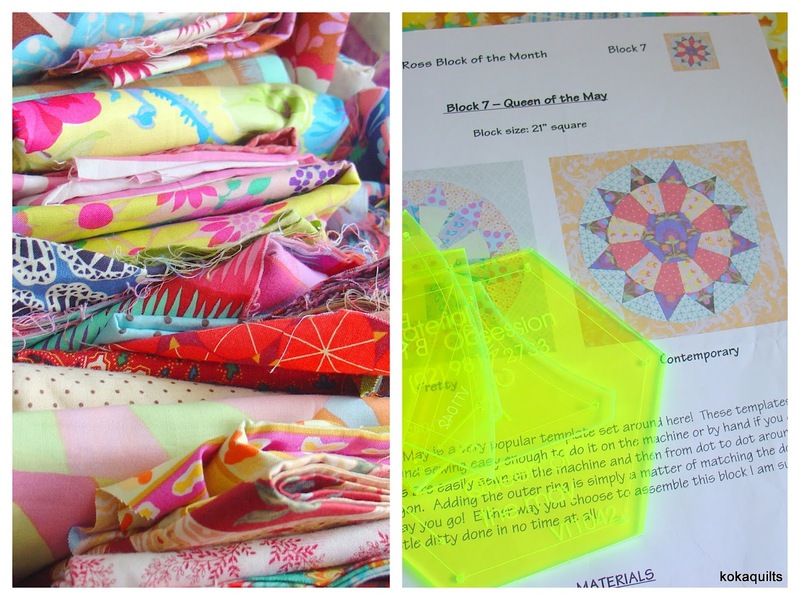 Glad you're taking part in the Quilt Festival, and lovely to read the recap of the quilt story - as gorgeous as ever!! I love it! That yellow background is just perfect. It reminds me of quite a few Australian quilters, but the way you've put it all together means it's totally yours. Well done. This is one of my favorite quilts you've made. I just love the mix of florals, plaids and stripes. The yellow floral background was a perfect choice coupled with the blue ric rac. I think your quilt needs to come for a visit to the U.S. Stunning quilt. 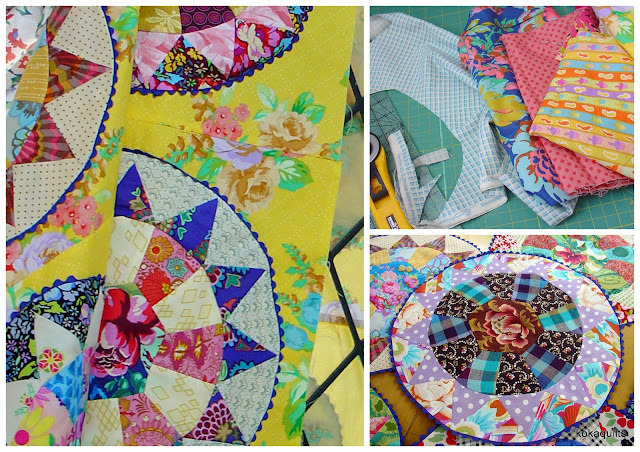 Love the colourful fabrics and how you have used them together. This is one of my favourites, so it's lovely to see it again. OOh, The yellow and blue are so pretty together. Using blue ric rac was genius! I love ric rac. I thought I was the only one. Gotta LOVE the riot of color!! I like your bold choice in that bright yellow background, too. Just wonderful, I love it. Great mixing of fabric, the end result is so much fun! You've inspired me to make my next quilt something like this...bright and fun!! i do not know if this is technically a millefiori quilt, but it looks like one... and the use of ric rac is soooooo ingenious! Beautiful! I think this is such a fun quilt - the colors are so happy! Beautifully done! I'd have chickened out on using the yellow floral, but it works so well. Congrats on a gorgeous quilt. You choose fabrics which worked wonderfully with the design. A little like the bright quilts of Blue Mountain Daisy/Rachael Daisy.